Speechie Freebies: Unwrap the Gifts! Who doesn't love opening presents?! This worksheet takes just a moment to set up and can be used for articulation, language or fluency therapy. 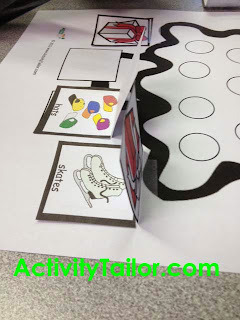 Simply print out the two sheets (included) and provide either a catalog or 1.5" x 1.5" target cards. Once you've used in therapy, it can be shared at home for additional practice. Caregivers can be given three clues to help them guess what's inside the package. For full instructions and to pick up the FREEBIE, click here. And please don't forget to vote for Speechie Freebies in the EduBlog Awards, group blog category. Voting ends tonight (12/18/13 at 11:59 EST). We'd love your support!